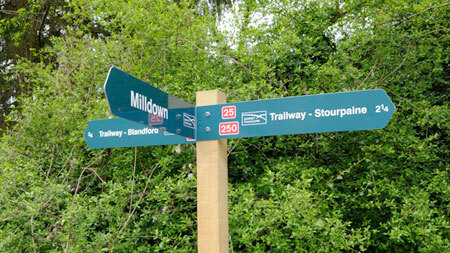 The Trailway now extends approximately 14 miles from Sturminster Newton to Spetisbury, with a section in Stalbridge we aim to link with, providing a safe route for walkers, runners, cyclists, equestrians and people with mobility scooters. The Trailway is largely made up of sections of the old Somerset and Dorset Railway which linked Bristol and Bournemouth until the 1960s. North Dorset Trailway Network is a charity that campaigns to extend and improve the Trailway as a sustainable transport route and recreation space for local people and tourism. 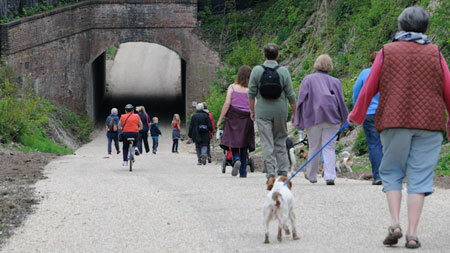 You can read more about our plans and aspirations in Extending the Trailway. The interactive map to the left shows the route of the Trailway in blue. Pinpoints Key: Black - car parks, red - take care, green - other access points. For a downloadable / printable map click here. Reducing our Carbon Footprint: Cycling or walking instead of an efficent hatchback will save 1.2kg of CO2 over a 10km journey - thanks to the Trailway many local journeys to school and work are now CO2-free, reducing traffic congestion and keeping people fitter. The Trailway is managed by North Dorset Countryside Service - for maintenance issues please contact Dorset Countryside Team by email or by phoning 01258 456970. To see the Countryside Team's website click here.